In past blogs, our group has discussed the importance of providing food samples, mass customization, benefits of offering value-added products, and other strategies to encourage customers to purchase your products. Each of these is designed to alert and remind customers about what you sell and increase consumer purchases. In today’s blog, I wanted to provide a few more ideas that can also help increase purchasing. How many different ways can customers use your products? Your customers probably have a pretty good idea of how to use most of your products. Fresh fruit are eaten without any preparation or they can be used as an ingredient in more common dishes, the same with vegetables. The value-added products that you offer, such as jams and chutneys, can be spread on toast or crackers. There is at least a primary and a secondary food use for everything you sell. But, there are probably many more ways that your products could be used, and the more ways that a customer can use your products – the more products they might purchase. A well-know brand of an instant coffee drink suggests using the powder as a creamer in other drinks. “Gourmet” jars of peanut butter suggest uses that go well beyond sandwiches. Peanut butter is a perfect ingredient for Thai food, African peanut stew, and what would be better than a peanut butter and chocolate s’more (though expect it to be a bit more “gooey”)? Cereals are no longer just from breakfast - they can be used in casseroles, as breading for meats, and so much more. Maybe your soy sauce bottle has been in your pantry or fridge for quite a while and only gets used to flavor rice? A more prominent soy sauce company developed magazines and online ads with Thanksgiving meal recipes that listed their product as one of the ingredients. Of course some of these ideas are not new and novel; and consumers probably have a similar recipe already saved. But, many times consumers need to be reminded about the multiple uses that a product can provide, or the recipe needs to be promoted at the right time of the year. Might the turkey basting recipe appeal to consumers during the summer? Maybe or maybe not, but when a consumer (who is not a vegetarian/vegan or one who doesn’t like turkey) thinks about the meal they will have on Thanksgiving, a majority think of turkey and how to give it flavor and keep the meat moist. Soy sauce, apparently, can do just that. 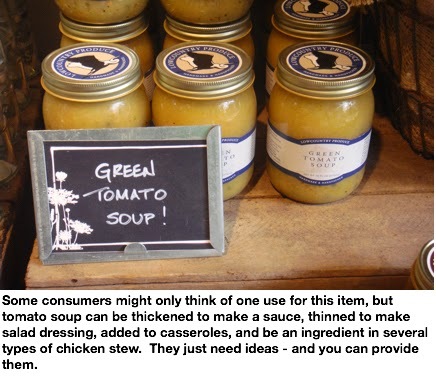 So, how many different ways can a consumer use fresh produce and value-added products you sell? A search on recipe websites, review of any recipes you may have provided customers in the past, or just brainstorming can provide a fair number of ideas. Another approach is to look at more traditional recipes and substitute one or two of the ingredients listed with your products to change the flavor, texture, or other attribute. Once your list of ideas is complete, think about the timing of when you should promote them on your website, via social media, in newsletters, and using in-store signage. Next week I will take about a couple of other ways that can increase consumer purchasing.